Cyron USB200/201 is a simple and secure way to add USB charging capability to any 15Amp standard outlet in the USA. 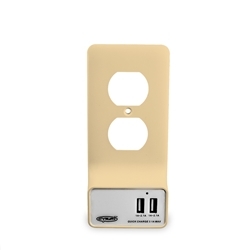 Simply replace your outlet cover with Cyron's cover plate! By replacing a couple of screws and in less than 90 seconds your outlet will have high speed charging capability for ever more! The new smart design safely conducts electricity to the cover plate, making it an active electrical device. Does not work with GFCI, larger amperage outlets, Legrand and other non-standard outlets. Not suitable for wet locations and outdoors. Available in two colors Almond and White. Also available in duplex and decor outlet styles.